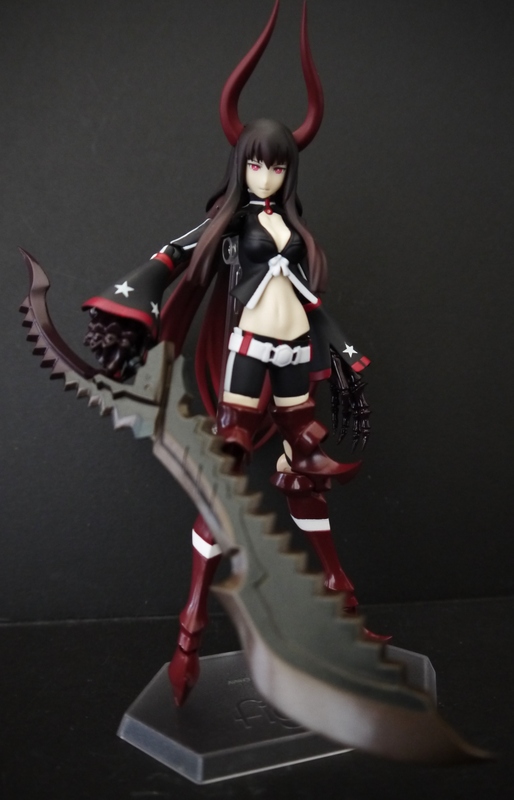 I’ve never really been partial to the Black Rock Shooter Figma line-up, mostly because there’s a lot more BRS merch out there in higher quality. The Figma’s are in no way bad or low in quality, but I’d personally prefer a Good Smile Company statuette over an average figurine. 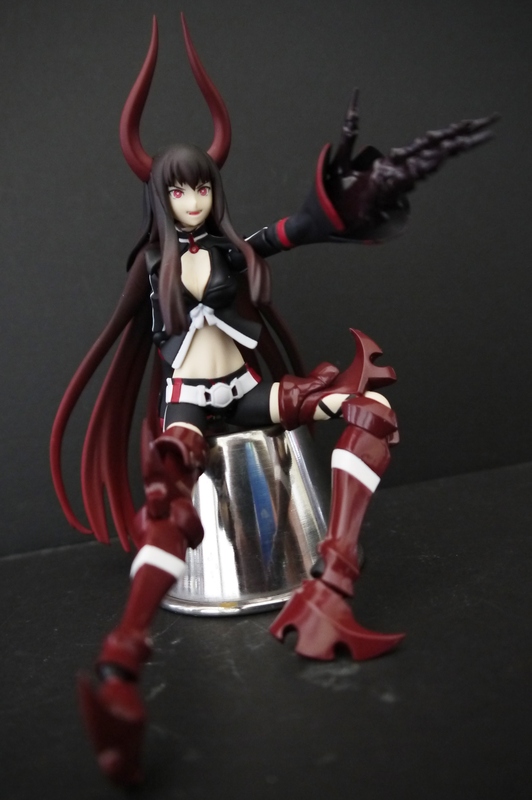 Now, this isn’t actually my Figma. My good friend purchased it at Anime Expo 2013 whilst shopping for merch. He got a really good price on it, roughly $35 I believe, where the average was $60. Not something I’d normally pick up myself, so I’m glad my comrade is giving me a chance to mess with it and review it. The figure itself is actually pretty well sculpted; much better than I expected. I like the sleeker, seamless and sharp look of the statuettes more, but the Figma itself isn’t half bad. I’m honestly most impressed with the paint job on this little thing. 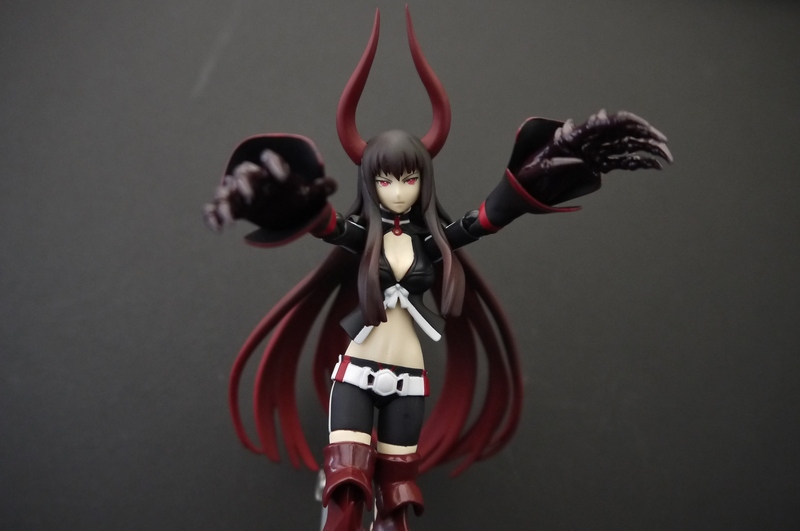 The dark gloss red on the hands and legs is most impressif, along with all the little details on her thighs and sleeves. No mass production blemishes. Black Gold Saw’s main weapon of choice, a giant menacing looking sword/saw/horriblemurderweapon. The paint apps on this are really nice, with it sporting like, 3 colors. But seriously though, that thing looks scary. Almost every edge looks painful. 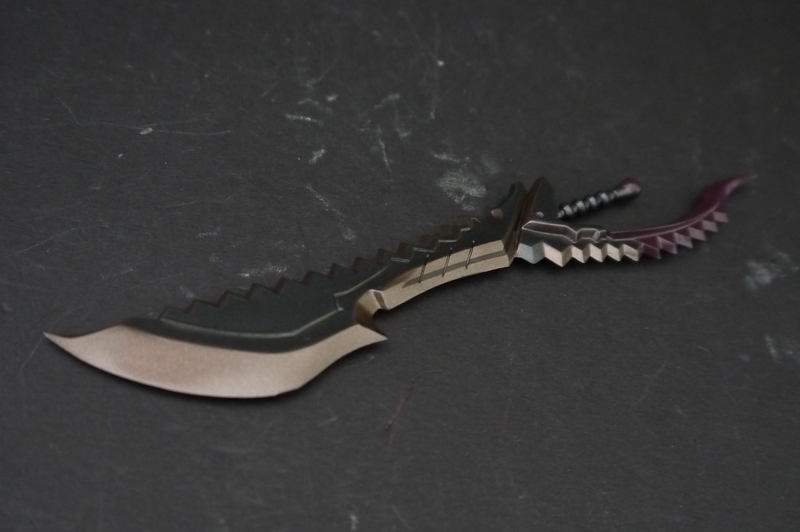 I’d hate getting stabbed by that. The sword’s hilt is removable, and it’s inserted into the hand first before attaching the rest of the sword to it. 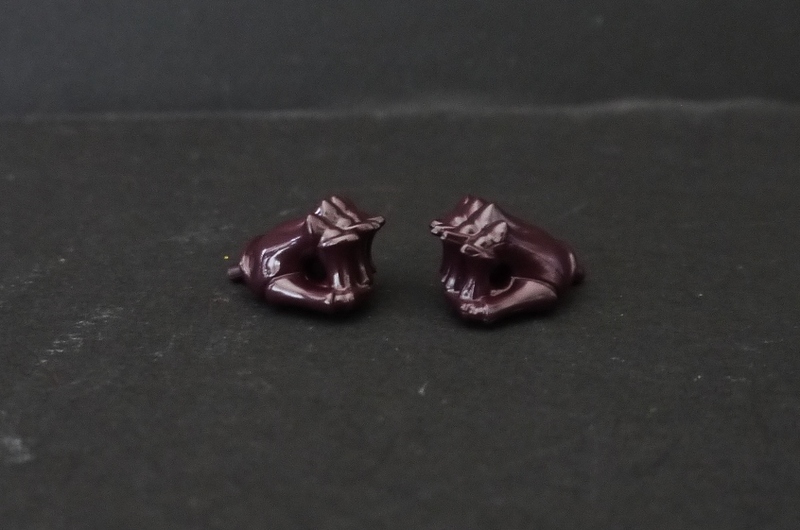 To be honest, the wrist attachment for the right arm is actually really weak, for just about all the swappable hands. This makes wielding the blade just a little frustrating, since it has a habit of falling off. 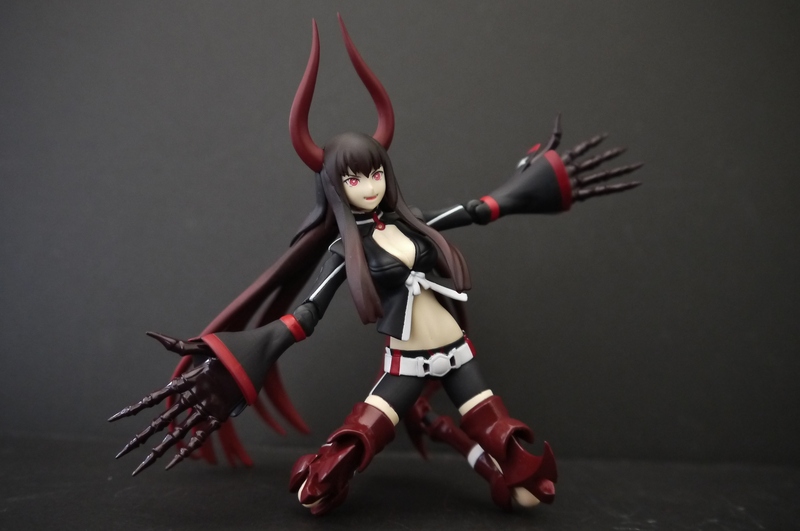 Speaking of hands, the bulk of accessories you get with this Figma are extra hands. And not all of them are really even needed or useful. The above ones have stumped me; the holes are too small to plug the sword hilt into, and there’s really nothing else that would fit those plugs, so I question why they’re included in the package. Maybe to fill it out more without any actual substance? Other than that, you get a relaxed open pair, two open and extravagant hands, a pair of holding hands, and a single right manipulator dedicated to wielding the sword. You also get three interchangeable faces: a calm and placid, psychotic/mentally imbalanced wife, and angry face. I personally prefer the crazy insane I-will-murder-your-family face. 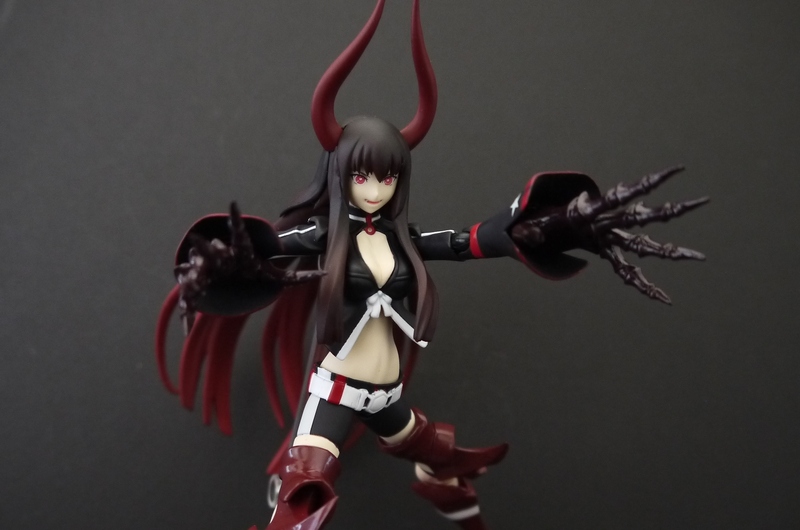 The articulation is pretty good, I’d say standard Figma fare. The usual lack of waist is evident, along with the chest articulation used to replace that. My biggest gripe with it is how loose all the joints are, straight out of the package. I know not all Figma are like this; Silver Crow and Black Lotus are still holding up extremely well. Black Gold Saw, however, is really floppy for some reason. Guessing it’s just a bad batch. 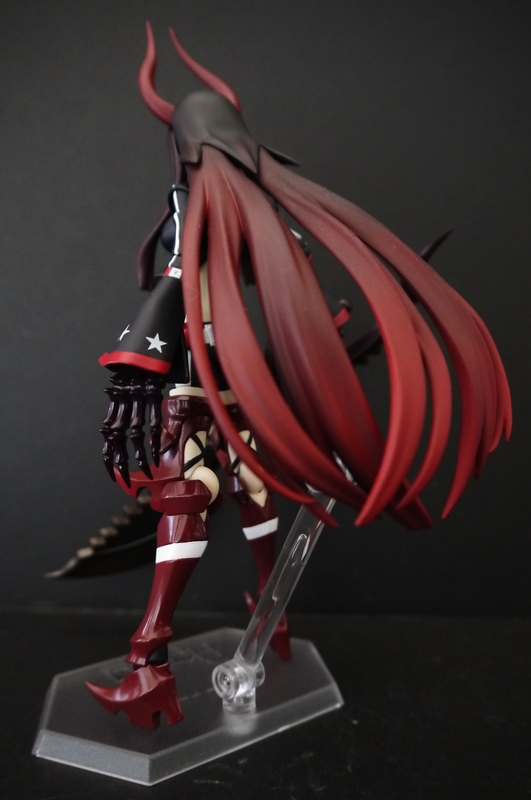 Another slight gripe I have with this Figma is the fact that the standard display base can’t really plug into the back. The connection is really shallow and loose, and falls out rather often. If you really push it in deep enough though, it’ll hold her up no problem. Just not as tight and stable as some other Figmas I’ve had. 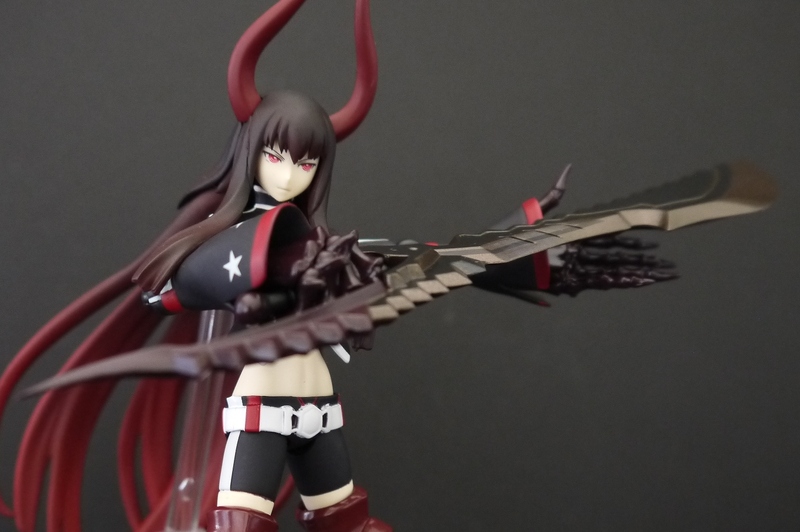 Something I found pretty neat with Black Gold Saw is the use of soft plastic all throughout her body. 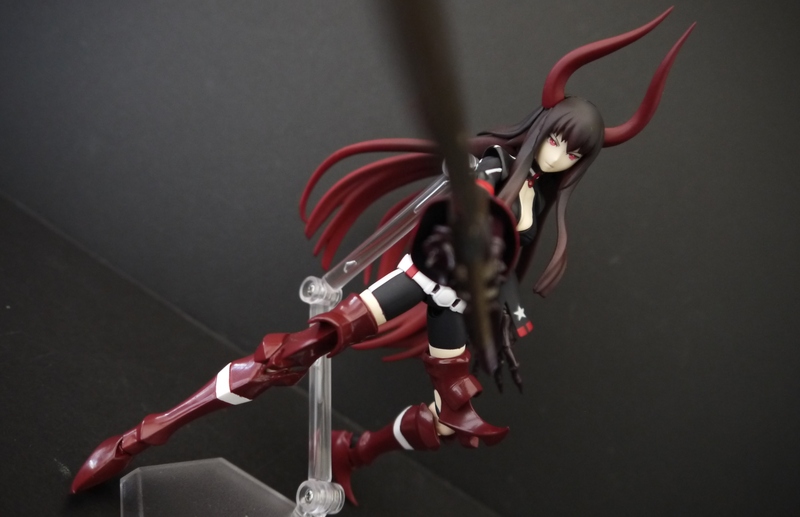 This is the most I’ve seen PVC used in a Figma, probably because she’s the most human Figma I’ve encountered. Parts of the shirt, the top part of the sleeves, and the hair is all made of PVC, if I’m not mistaken. It works extremely well (especially in the arms) to give her a much broader range of articulation without sacrificing detail. And of course, because it’s a Figma, you gotta have some fun with it…these little things are packed with a whole mess of articulation and funky accessories for a reason! Also, as a little side-note, Black Gold Saw’s hair is actually really restricting. There are two joints in there that allow it to move around a bit, along with some of that soft PVC for even more leeway, but even then it’s hard to work with. I hate getting the display stand plug in the back with the massive hair pieces in the way. On the bright side though, like the rest of the figure, the hair is excellently painted. It goes from a dark brown/black to a nice vivid red at the tips. Black Gold Saw also doesn’t really have stand-able feet. They’re like blades at the bottom, and unless you find a perfect center of balance when standing her up, you’ll need the assistance of the stand. The legs themselves are aesthetically gorgeous though. That knee bend with the armor is pretty fabulous. Overall this isn’t a bad figure; I’m actually very impressed with its sculpt and paint apps; much higher than I expected. 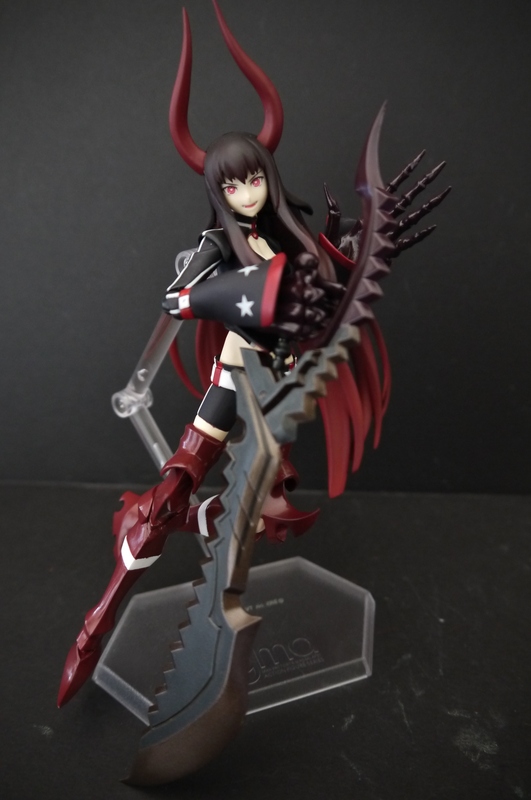 At the end of the day, I may still prefer the static statuettes over the Figma for Black Rock Shooter, but if you’re looking for a high quality and yet affordable action figure, this is the way to go. There’s really nothing I can dock it for given what it’s trying to do. The loose joints are a problem particularly for this one, but I’m sure that isn’t a standard. 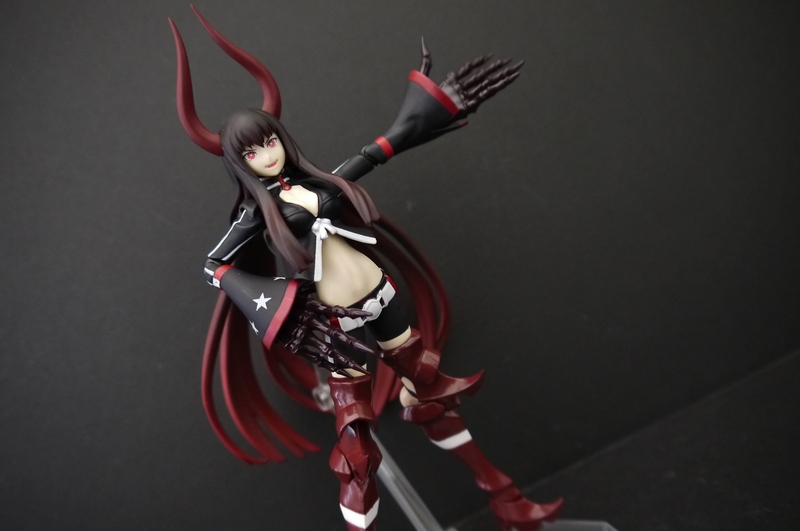 Oh my.. that’s one of the best figma’s i’ve ever seen so far! Great buy! Nice details and colors.